John Goreham Contributing Writer, GM-Trucks.com 7-31-2018 Two recent studies done by our friends at iSeeCars.com have looked at two different aspects of vehicle ownership. The first study looked at which vehicles are driven the most. That report also had information on which were driven the least and the Corvette came out on “top” in that listing. The newest study casts that in an even more interesting light. The new study looked at which vehicles owners keep the longest. Interestingly, the Corvette was again at one end of the Bell curve. It is the “passenger car” that owners keep the longest. iSeeCars.com’s CEO, Phong Ly explains the Corvette’s long average stay, saying, “Sports cars tend to not be primary vehicles, which is why owners might hold on to them longer than the average car since they are not subjected to as much wear and tear.” Do we have any Corvette owners in the group? If so, how long have you had yours and why do you think the Corvette is the longest held, least driven car? Feel free to chime in if you haven't gotten your 'Vette yet too. John Goreham Contributing Writer, GM-Trucks.com 6-4-2018 GM’s Executive Vice President of Global Product Development, Mark Reuss, had the unfortunate and embarrassing experience of crashing a pace car this weekend at the Detroit Grand Prix Indycar event. Reuss lost control of the Corvette ZR1 in a corner with uneven pavement. The vehicle appeared to oversteer and corrections sent Reuss into the wall nose first. Thankfully, Reuss and a track official in the passenger seat were uninjured. Members of GM-Trucks.com staff have met Mark Reuss on multiple occasions and have shared racetracks with him. Mr. Reuss is “guy’s-guy” who is very easy to speak to. We’ve had the pleasure of sharing meals with him and informally discussing a wide range of topics. Mr. Reuss has also granted Zane Merva of GM-Trucks.com formal interviews to give updates on truck developments. At the track events we visited, Reuss took advantage of media days to get to know and hear from members of the media during important Chevrolet and Cadillac performance model launches. He also took advantage of the open track to turn hot laps in the products he helped bring to market. His competency behind the wheel of 700 hp + cars is not in question. Mr. Reuss also knows this particular track, having driven it on many occasions before this event. GM issued this statement on the accident: “We are thankful that there were no serious injuries. Both the pace car driver and the series official were taken to the infield care center, where they were checked, cleared and released. It is unfortunate that this incident happened. Many factors contributed, including weather and track conditions. The car’s safety systems performed as expected.” Mr. Reuss posted a comment to his personal Facebook page thanking friends, family, and GM fans for their support. Since the post was not public, but only shown to his FB friends, we have opted not to reproduce it in its entirety as other media have chosen to do. Reuss apologizes in the post, and thanks his well-wishers, but says he let people down. We don’t feel let down. If a pace car isn’t a real track car, and if it isn’t going to be driven hard, then what’s the point? John Goreham Contributing Writer, GM-Trucks.com 11-30-2017 Chevrolet pulled the cloth off a new Corvette ZR1 at the sunny LA Auto show this week. This is the first ZR1 convertible since the original 1970 model-year ZR1. The new convertible ZR1 starts at $5K above the coupe with an opening price tag of about $124,000. “The new Corvette ZR1 convertible is a supercar in all respects,” said Mark Reuss, executive vice president, Global Product Development, Purchasing and Supply Chain. “Few others can challenge the ZR1 convertible’s power and speed while offering the exhilaration of top-down motoring.” The new lightweight convertible top adds less than 60 pounds and can be lowered and raised remotely and at speeds up to 30 MPH. As we recently reported, the Corvette ZR1 has a top speed of up to 212 MPH depending upon the aero package chosen and comes with a 755 hp V8 engine. GM plans to auction off the first ZR1 at a Barrett-Jackson event to benefit the veterans’ support group, the Stephen Siller Tunnel to Towers Foundation. John Goreham Contributing Writer, GM-Trucks.com 7-12-2017 Baseball's 2017 All-Star Game MVP, Robinson Canó, chose a new 2017 Corvette Grand Sport over a new 2017 Chevy Colorado ZR2 last night following the game. Financially, this is a sound move. The Grand Sport starts at $67K and the ZR2 ends at about $48k. Money aside, which would you have opted to drive away if you had the choice? In case you missed the game, Seatle's Canó, who went 1-for-2 in the contest with a 10th inning home run, RBI and a run scored. Brian Sweeney, U.S. vice president of Chevrolet, commented on the game, saying, “Robinson Canó turned in a tremendous performance tonight and is an excellent example to all baseball fans, and especially our kids, that hustle, determination, and teamwork are what wins, and that is why Chevrolet is proud to present the MVP award." Chevy didn't say if the ZR2 has a diesel engine or not, let's assume it had whatever you would prefer. What's your choice? Vette, or ZR2? John Goreham Contributing Writer, GM-Trucks.com 6-7-2017 Mazda Miata V8 conversions usually seem to use Ford engines for some reason. Ford has made some great V8s over the past century, but we'll take a Corvette engine any day. So did James and Janna Weeks. While Janna was serving in Afganistan, James began a resto-mod project for her in honor of her late mother, who they had inherited the NA-generation Miata from. James told us that the Corvette engine was from another project and it replaced a turbocharged 1.8-liter engine that was the first engine upgrade to Zoom, the car you see above. James told that Zoom us now sports a 5.7-liter LS6 V8 with modified heads, intake, and cam. The transmission is a T56 6-speed. The rear end is a Ford 8.8 with 3.08 gears. Zoom once ran to 156 MPH on the half-mile on a closed course. Then James and Janna turned on the nitrous and Zoom posted 165 MPH. A huge V8 in place of a tiny 4-banger usually disrupts the balance of a conversion car. That is unless the engine coming out is iron and the one going in is aluminum. James says that the whole conversion added about 300 pounds total to the weight of the car and that the front to rear weight distribution is only 1% changed to 52/48. John Goreham Contributing Writer, GM-Trucks.com 5-9-2017 General motors is sitting on a lot of inventory right now. Camaros and Corvettes, in particular, have started to pile up at dealerships and Chevy needs to make room for 2018 model year inventory that will arrive this fall. Cue the discounts. Carsdirect.com is reporting that Chevy will discount the Corvette of your choice by 10%. Now, given the steep discounts we periodically report on trucks, that may not seem very impressive, but like many factory discounts, it can serve as a starting point in negotiations, not an ending. Also, with Corvettes at a $100K plus price point at the high end of the trims, that can equate to a discount of as much as five figures. According to our source, the promotion runs through May 31st. John Goreham Contributing Writer, GM-Trucks.com 12-27-2016 Death, taxes, and a pushrod V8 in a Corvette. At least until this year. According to documents found by MotorTrend, a new dual overhead camshaft V8 engine will soon be in the Corvette and its name is LT5. There was an LT5 with cams on top once before in the 1990s, but it's been a while since we have seen that. MotorTrend speculates that this might be the heart of the white whale - the mid-engine Corvette's engine. We doubt it. We spotted this story at Torque News, where Patrick Rall (Who lives just outside the GM proving grounds) goes into finite detail about what the engine could be, and what it most likely isn't. The documents say 6.2-liters, aluminum, and not much more. Both publications doubt this is the new base engine for the 2018 "Vette. That is because the base engine appears to also be listed in the service documents that are the basis of all this intrigue. Nor is the engine said to have forced induction (turbocharging or supercharging). That makes it unlikely to be the engine in any top-spec Corvette trim. 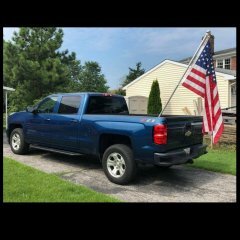 What say you GM-Trucks.com faithful? Is this dual overhead camshaft engine just a ruse or misunderstanding? Could it signal some kind of high-RPM, normally-aspirated engine for a special Corvette? Image Note: That's not the engine in the story being built. Can anyone guess without cheating what that engine is? John Goreham Contributing Writer, GM-Trucks.com 11-22-2016 If all you want for Christmas is a Corvette, Costco may have your best deal. The group has run a Holiday Sales Event for many years. What we like most is that the number of people who give Costco's auto sales program top scores for value, service, and overall buying experience is nearly 100%. This is the first year the Corvette has been part of the program which offers buyers: - GM Supplier Pricing - Plus most currently available GM incentives. - Plus Costco Executive Members will receive a $700 Costco Cash Card and Gold Star - And Business Members will receive a $300 Costco Cash Card for purchasing a qualifying model and completing all eligibility requirements. LS3 Corvette cam without a tune? I have a 2000 GMC Sierra 2wd ext cab with 134,000 miles on it. My buddy has a corvette that he just put a cam in, thus he has his stock cam. Would I be safe to put this cam in my truck without a tune? I want to put headers and some other mods on it before I get the tune, so it would be a month or two before I got it. John Goreham Contributing Writer, GM-Trucks.com 5/2/2016 The 2017 Corvette Grand Sport will start at $66,445 for coupe models and $70,445 for convertibles when the new trim goes on sale this fall. These "starting prices" are always a little deceiving. With options like the Z07 package which includes carbon ceramic brakes, five custom wheel choices and available carbon fiber ground effects prices can quickly climb. Still, $70K for a track-ready Corvette is bargain. The Grand Sport uses the LT1 V8 with 460 hp. For more details on the newest Corvette Trim for 2017, please see our prior story. The Venom GT uses a twin-turbo 7.0L V8 Chevrolet engine modified with two turbochargers. It has a Ricardo six-speed manual. The Venom GT is capable of a 0-60 MPH sprint in under 2.4 seconds and can run from 0-200 MPH in under 13 seconds. Hennessey's Venom GT Hardtop is the current high-speed record holder with a recorded time of over 270 MPH. John Goreham Contributing Writer, GM-Trucks.com 4/15/2016 What has 1,451 hp, a top-speed record, and no roof? The Hennessey Venom GT Spyder. This March 25th, the Team at Hennessey set out to break the Bugatti Veyron Super Sport Vitesse's top speed in a convertible record. At the hands of Brian Smith, director of the Ford Performance Racing School, the Venom GT Spyder recorded a time of 265.6 MPH. The speed run was confirmed by independent speed testing firm Racelogic. The incredible test was conducted at Naval Air Station Lemoore and witnessed by Commander Darren Fouts, Air Operations. The Venom GT uses a twin-turbo 7.0L V8 Chevrolet engine modified with two turbochargers. It has a Ricardo six-speed manual. The Venom GT is capable of a 0-60 MPH sprint in under 2.4 seconds and can run from 0-200 MPH in under 13 seconds. Hennessey's Venom GT Hardtop is the current high-speed record holder with a recorded time of over 270 MPH. Thumbs Up or Down On Callaway Corvette AeroWagen? We like the look. This conversion could be used as a grand touring vehicle with room for luggage. A spare tire might fit. Going off-road and hunting off the back tailgate, like the original shooting brake autos were designed for, is probably not in the cards, but who knows? Tell us what you think below. Visit Callaway for more details. John Goreham Contributing Writer, GM-Trucks.com 4/8/2016 This week, well after April Fools Day, Callaway launched its new C7 Corvette AeroWagen Package. The shooting brake design is a two-door station wagon conversion of a modern Corvette. Callaway will do the conversion for any C7 Corvette Stingray or ZO6. The car will remain a two-seat vehicle and no four-door is planned. Callaway says the body additions will all be supplied in raw carbon fiber, so added weight should not be an issue. We like the look. This conversion could be used as a grand touring vehicle with room for luggage. A spare tire might fit. Going off-road and hunting off the back tailgate, like the original shooting brake autos were designed for, is probably not in the cards, but who knows? Tell us what you think below. Visit Callaway for more details. The Grand Sport Collector Edition features a Watkins Glen Gray Metallic exterior with Tension Blue hash-mark graphics, satin black full-length stripes, black wheels and an exclusive Tension Blue full leather and suede-wrapped interior. This The Grand Sport Collector Edition features th 6.2L LT1 V8 engine, capable of 460 horsepower and 465 lb.-ft. of torque. The car is painted Watkins Glen Gray Metallic and comes with Tension Blue hash-mark graphics, satin black full-length stripes, black wheels and an exclusive Tension Blue full leather and suede-wrapped interior. The Grand Sport Collector Edition is a limited production run. VIN 001 is sure to be a very valuable car in the years to come. Think of your purchase as an investment as well as a charitable donation. John Goreham Contributing Writer, GM-Trucks.com 4/5/2016 If you want to own the very first retail Corvette Grand Sport Collectors Edition you better act fast. Chevy is auctioning off the car this Friday at the Barrett-Jackson Palm Beach Florida auction. VIN 001 will cross the block at at 6 p.m. EDT. The lot number is 3003. If you do opt to bid on this very special Corvette, 100% of the coin you drop will go to support the Barbara Ann Kamanos Cancer Institute. GM is not just donating the car, the GM Foundation has also made a significant grant of $400,000 to also fund cancer research at Karmanos. The Grand Sport Collector Edition features a Watkins Glen Gray Metallic exterior with Tension Blue hash-mark graphics, satin black full-length stripes, black wheels and an exclusive Tension Blue full leather and suede-wrapped interior. This The Grand Sport Collector Edition features th 6.2L LT1 V8 engine, capable of 460 horsepower and 465 lb.-ft. of torque. The car is painted Watkins Glen Gray Metallic and comes with Tension Blue hash-mark graphics, satin black full-length stripes, black wheels and an exclusive Tension Blue full leather and suede-wrapped interior. The Grand Sport Collector Edition is a limited production run. VIN 001 is sure to be a very valuable car in the years to come. Think of your purchase as an investment as well as a charitable donation. With 460 hp and 465 lb-ft of torque the LT1 has enough power and twist for most road-going project cars or track day cars. https://www.youtube.com/watch?v=Q50GD8eIra8&feature=youtu.be GM is calling this its most technologically-advanced crate engine ever, which is high praise given the LT4's higher power and torque output. You can learn more about the new LT1 here at Chevy's website. John Goreham Contributing Writer, GM-Trucks.com 3/28/2016 Do you have a project car that needs an engine? If so, Chevrolet would like to tempt you with an LT1 crate engine like that in the Corvette Stingray. With 460 hp and 465 lb-ft of torque the LT1 has enough power and twist for most road-going project cars or track day cars. https://www.youtube.com/watch?v=Q50GD8eIra8&feature=youtu.be GM is calling this its most technologically-advanced crate engine ever, which is high praise given the LT4's higher power and torque output. You can learn more about the new LT1 here at Chevy's website. The Grand Sport is all about lightness and cornering. Chevy calls it "A pure expression of the car’s motorsports-bred pedigree." This track-'Vette starts off with the LT1 V8 engine rated at (343 kW) 460 hp, with dry-sump oiling system and active exhaust. Both the rev-matching 7-speed stick and 8-speed paddle shifting automatic are available, and the auto has a Grand Sport-specific calibration. For the first time, the Grand Sport can also be combined with the Z07 package. When set up this way, the car can corner at up to 1.2gs. Chevy says that the new Grand Sport with Z07 package is within a fraction of a second of the prior ZR1's time around the Milford Proving Ground. Here are the highlights of the package: ◾Michelin Pilot Super Sport summer tires: 285/30ZR19 (front) and 335/25ZR20 (rear) ◾Specific Grand Sport wheel design: 19x10 inches (front) and 20x12 inches (rear) ◾Brembo brake system with (355 mm) 14-inch rotors and six-piston calipers in front and (340 mm) 13.4 inch rotors and four-piston calipers in the rear ◾Standard magnetic ride control, specific stabilizer bars and unique springs ◾Standard electronic limited-slip differential ◾Front Fender Inserts, Z06 Grill, Widened Rear Fenders ◾Optional Grand Sport Collector Edition features an exclusive Watkins Glen Gray Metallic exterior with Tension Blue hash-mark graphics ◾Available Z07 package adds carbon ceramic-matrix brakes and Michelin Pilot Sport 2 Cup tires. The Grand Sport will be on sale this summer in the U.S. and the Grand Sport Collector Edition in the fall. Chevy plans to offer the Grand Sport in Europe as well about three months behind the U.S. inventory allocations.